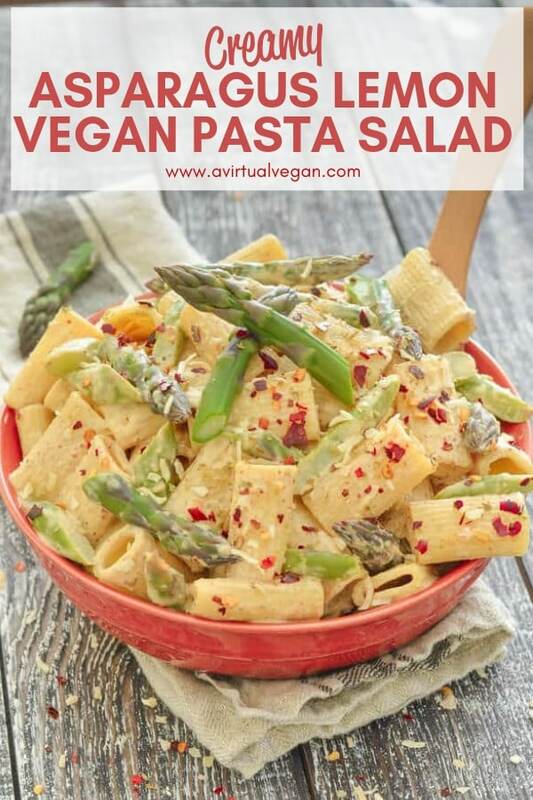 This Creamy Asparagus Lemon Vegan Pasta Salad is fresh & delicious, super easy to make, and perfect for quick mid week meals, make ahead lunches and gatherings! I tend to get so excited about the arrival of asparagus every year that I buy a bunch literally every-time I go to the greengrocer. It is one of my favourite veggies and I just can’t get enough. However, since my Vegan Omelette with Asparagus recipe, which was published not long after I started AVV, there hasn’t been another recipe featuring asparagus. 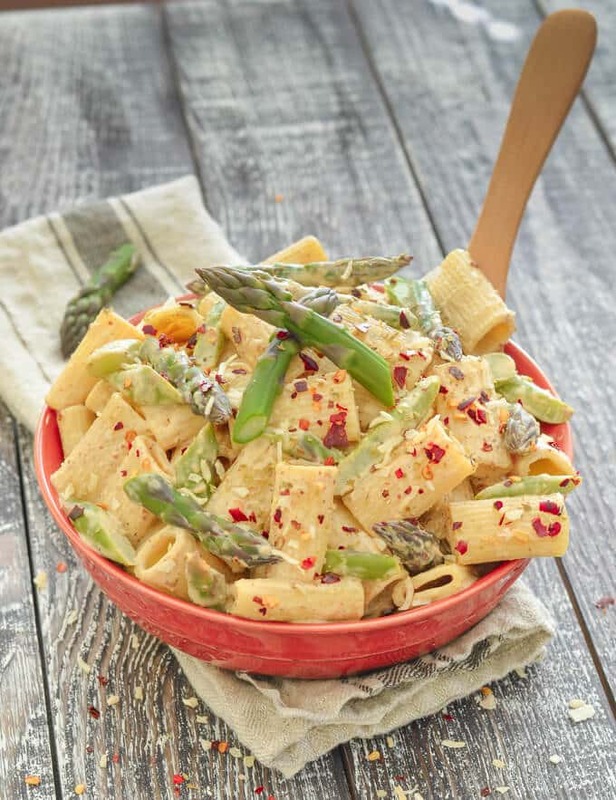 It’s about time there were more, so kicking things off today is this Creamy Asparagus Lemon Vegan Pasta Salad. My go-to way of cooking asparagus is just to lightly sauté or griddle it with a little olive oil, salt and freshly ground black pepper. It’s pretty hard to beat when cooked like that but in this salad I have taken it up a notch by adding pasta, a delicious creamy, tangy, lemony sauce and a generous sprinkling of Frontier Co-op Organic Crushed Red Chili Pepper. It’s so tasty and now the sun has decided to show it’s cheery face, is perfect for all of your summer picnics, cookouts, pot lucks or just for dinners and packed lunches. This Creamy Asparagus Lemon Pasta Salad is incredibly easy to make. In fact it can be whipped up in the time it takes the pasta to boil. That’s just 10 minutes folks! How’s that for quickness? Just perfect if you get invited to a last minute get together or end up with unexpected guests who need feeding. The secret to this pasta salad? 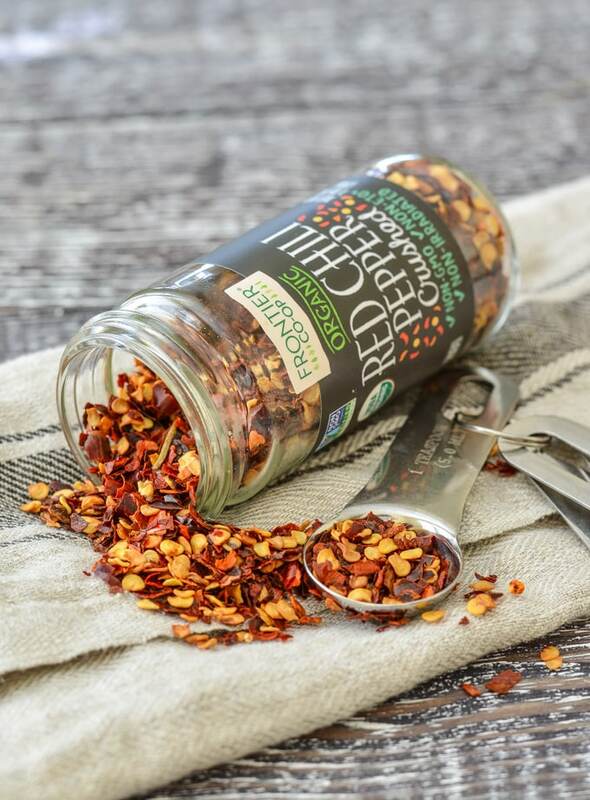 Freshly picked asparagus, plump juicy lemons and good quality herbs and spices like these Crushed Red Chili Pepper flakes which add a lively kick to this dish. I’m happy to be partnering with Frontier Co-op again this year, whose non – GMO, non-ETO (ethylene oxide), organic and Fair Trade spices and herbs are a staple in my kitchen and taste awesome in this recipe. 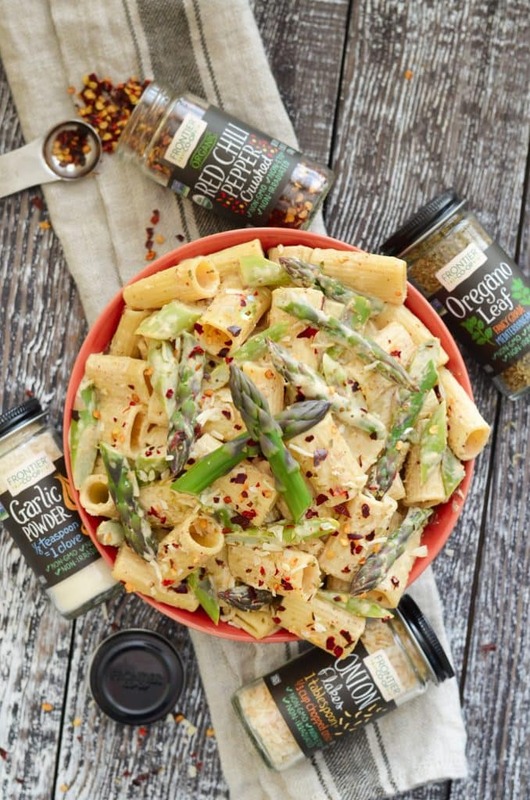 To make the Asparagus Lemon Vegan Pasta Salad, simply cook your pasta of choice in salted boiling water. While it’s bubbling away add the dressing ingredients to a blender and blend up until smooth. Yes, there is tofu in the dressing. It might seem strange but it works really well to create a smooth, creamy, super velvety texture, whilst keeping the fat content of the recipes low. You have probably noticed by now that I have a deep love for vegan tofu recipes. They seem to be popping up all over the place of late. As for the asparagus, there are two different ways to cook it. You can choose which suits you best. For an oil-free ( and hassle free) method, simply add the asparagus to the boiling pasta in the last couple minutes of cooking time. The second way to do it is to griddle or sauté the asparagus in a little bit of olive oil and a sprinkle of salt and pepper. It cooks so quickly that it only takes a few minutes longer and it means that you don’t dilute any of the precious flavour in the boiling water. It’s totally your choice though. I do it both ways. Often laziness wins though and it gets thrown in the pasta pan! Once the pasta is cooked it’s just a case of draining and rinsing it in cold water to stop it cooking anymore, then combining with the blended dressing and the asparagus. Whilst there are chili pepper flakes in the dressing, I like to sprinkle my pasta salad with more, one, because I like the heat and texture they give against the soft cool pasta and two, because the red looks so pretty! When serving up I sprinkled on a few Frontier Co-op Onion Flakes too. I had never tried them until recently but have been caught in the kitchen sneaking a handful on numerous occasions since then. I’m pretty sure they aren’t designed to be snacked on like that but they are too delicious for me to resist! 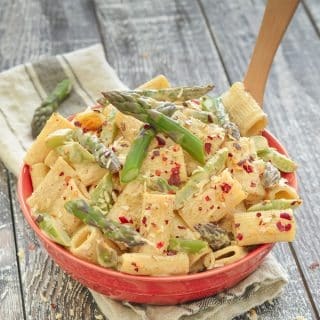 Seriously, this Creamy Asparagus Lemon Vegan Pasta Salad is so good with hardly any effort at all and it’s flexible too. If you don’t have any asparagus feel free to replace it with green beans, artichokes or broccoli. All of them will work well. It’s easy to make gluten-free too. Just use a good gluten-free pasta. If you make this recipe, be sure to snap a photo for Instagram and hashtag it #AVIRTUALVEGAN. I’d love to see what you cook! This Creamy Asparagus Lemon Pasta Salad is fresh & delicious, super easy to make, and perfect for quick mid week meals, make ahead lunches and gatherings! Wash and trim the asparagus then cut into 1 inch pieces. Bring a large pan of salted water to a rolling boil. While the pasta is cooking add all of the other ingredients (except the asparagus) to a blender and blend until smooth. Add the mustard and seasoning gradually to taste, and start off with only half the milk then add more to thin if necessary. Add the asparagus to the boiling pasta for the last 3 minutes of cooking time or sauté gently in a pan with a drop of olive oil and a sprinkle of salt and pepper until just tender. If sautéing immediately remove from the heat once tender and remove from the hot pan so it doesn't continue cooking. Use a colander to drain the pasta (and asparagus if you cooked them together) then rinse well with cold water to cool it and stop it cooking anymore. Or don't if you want the pasta salad to be slightly warm when you eat it. Pour the pasta and asparagus into a large bowl then stir through the dressing. The pasta salad will keep for a couple of days in the fridge but the sauce might dry out a little bit. To make it as good as new just add a tablespoon or two of water and stir well before serving. This post is sponsored by Frontier Co-op, whose spices I love and use regularly in my everyday cooking. Thank you for continuing to support the brands who help make this site possible.